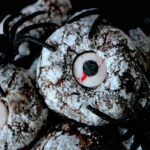 A Halloween cookie recipe, featuring an easy and delicious brownie-like cookie with powdered sugar and spooky candy eyes. Sure, decorative Halloween cut-out cookies adorned with royal icing and intricate designs are great, but honestly, who has the time? Not me, and if you’re a mom with littles at your feet, probably not you either. 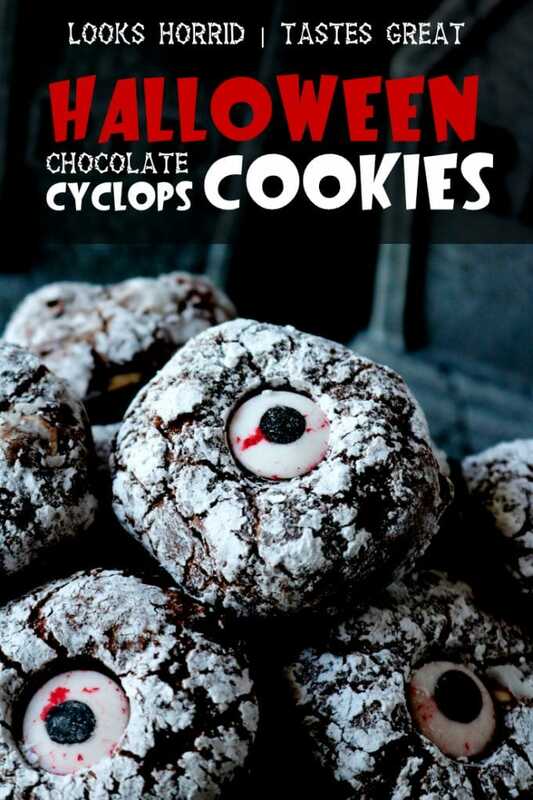 No, we need a much easier Halloween cookie solution, and this Chocolate Cyclops Cookie is exactly that: A homemade Halloween cookie that looks spooky, tastes great and takes only a small amount of your time. This cookie recipe was inspired by one of the first cookies I ever mastered as an at-home baker — the chocolate crinkle cookie. It is slightly chewy, with a big chocolate flavor that very closely resembles a brownie. Many recipes for chocolate crinkle cookies call for chopping and melting down chocolate. However, to keep these cookies simple, cocoa powder serves as a fine substitution. Once the dough is whipped up, the dough ball is rolled in powdered sugar before baking, and as it begins to rise and expand, the sugar separates, and cracks (or rather crinkles) begin to form. 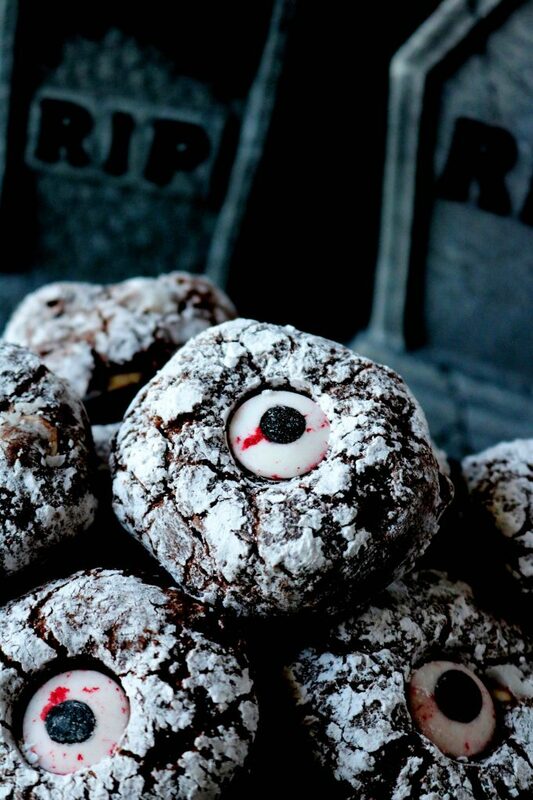 To make it spooky, before the cookies go into the oven, you simply plop a bloody candied eye decal in the center of the cookie. If your local grocer doesn’t carry them, you can usually find candied eye decals at specialty craft stores (like Michael’s) around Halloween time. Not only is this cookie easy to make, but it is also make-ahead and freezer-friendly. With special class activities, costume changes, Halloween parties and trick-or-treating ahead, a busy day is pretty much guaranteed. One less thing on the to-do list on any given holiday is a super bonus for us moms. To freeze the cookies, simply make them at your convenience and allow them to cool to room temperature. Once the cookies have cooled, transfer them to a freezer-safe, air-tight container, and place them in single layers with wax paper in between. The cookies require about 20 minutes to thaw. Simply pull them out of the freezer and allow them to sit at room temperature on the counter before serving. 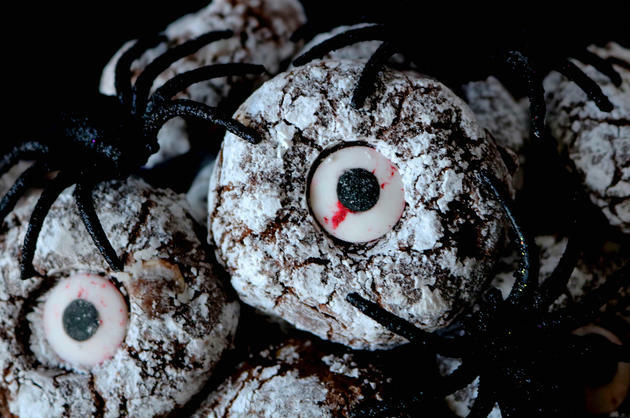 These creepy little cookies are perfect for all kinds of Halloween activities. Bake these chocolate Halloween cookies as a class treat, a special lunch box surprise or as the star of the show on any ghoulish tablescape. 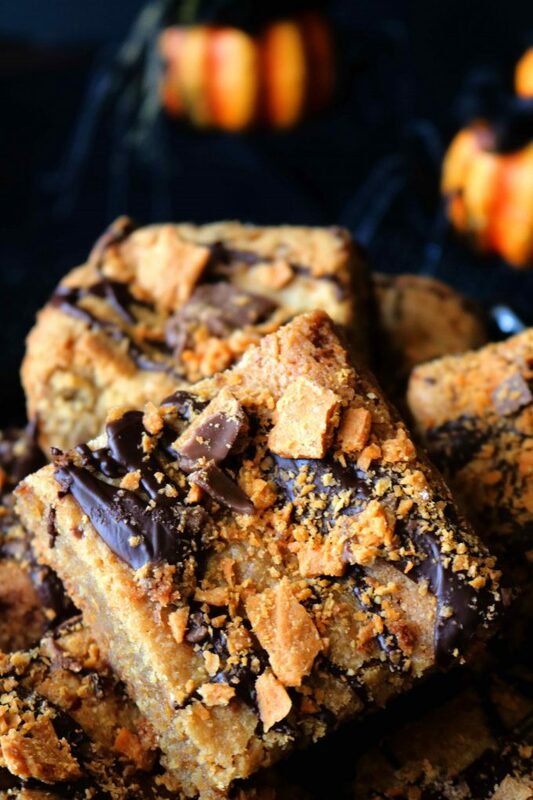 For more sweet treat Halloween recipes to add to your tablescape, try these Halloween Blondies featuring a peanut butter blondie topped with a drizzle of dark chocolate and crushed Butterfinger candies. If you’re looking for a Halloween treat on the cuter side, you might check out either these Halloween Pretzels dipped in chocolate and covered in festive pretzels or whip up a batch of adorable Halloween Cocoa Krispie Treats, adorned with (you guessed it) more festive sprinkles and candy corn. Yes, please! 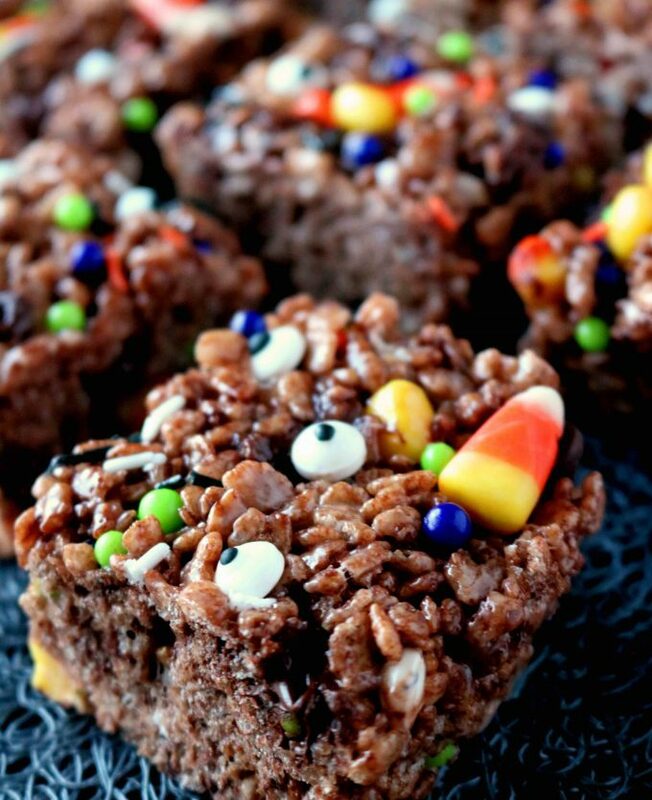 However, wherever, or whatever you plan to serve this Halloween, I can personally guarantee treats from around these parts will bring on enthusiastic grins from your little ones, and rave reviews from your taste testers. Please, enjoy! Preheat the oven to 325° and have ready a cookie sheet lined with either parchment paper or a silicone baking mat. In a medium-sized mixing bowl, whisk together the flour, cocoa powder, baking powder and sea salt. Set aside until ready to use. 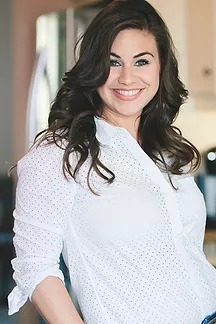 Add the sugar and eggs to the bowl of a stand mixer fitted with a paddle attachment, and mix on medium-high speed for 3-4 minutes, until pale yellow and noticeably thicker. If you do not have a stand mixer, use a large bowl and a handheld mixer. Reduce the speed of the mixer to low and add in the vanilla, followed by streaming in the melted and cooled butter. With the mixer still on low, gradually add in the dry ingredients. Add the white chocolate chips and mix once more. Have ready a small bowl of confectioners sugar. Scoop out 2 tablespoons worth of dough and roll into a ball. Roll the dough ball in the powdered sugar and transfer to the baking sheet, placing each dough ball about 2" apart. Place a candy eye decal in the center of each dough ball and press gently to adhere. Bake for 13-15 minutes. Serve and enjoy!